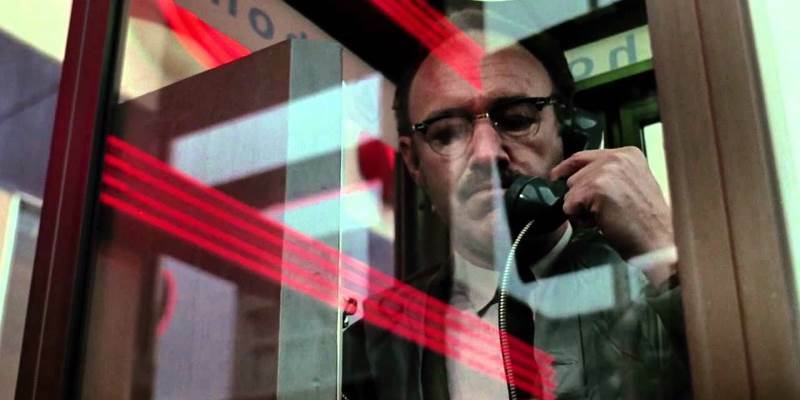 In San Francisco, profession surveillance expert Harry Caul (Gene Hackman) is working on his latest assignment, recording a discussion between a man and a woman in a busy courtyard. Having successfully recorded their conversation, Harry begins to grow suspicious that passing on the recordings to his employer may result in some dire consequences for those involved, as happened to Harry on another job sometime ago, which directly caused the murders of three people. The Conversation was nominated for me to watch by David Brook from Blueprint: Review, but it’s a film I’ve been looking forward to watching anyway. It’s the only film in John Cazale’s “Big Five” (the only five movies he appeared in before he died, all of which went on to be nominated for Best Picture at the Oscars) that I’d never seen (although I’m not exactly very familiar with The Godfather parts 1 & 2 or The Deer Hunter, but at least I’d seen them once each before) and I’m also a fan of Gene Hackman as a leading man, so I was looking forward to this. I’d heard it essentially spawned a spiritual sequel in Enemy of the State, which I’ve seen a couple of times and enjoyed, and was looking forward to seeing what Francis Ford Coppola would do with a similar premise. As such I was a little disappointed given my high expectations, mainly due to how little action takes place here compared to what I was expecting. This is a film about watching and listening. In much the same way that the assignments Harry and his associates take on, this film requires patience, and won’t always bear fruit in terms of what is required. We start out with a long, slow zoom from high up, focussing painfully slowly onto a busy courtyard quadrangle, upon which a mime is mimicking various people. It’s unclear what we’re supposed to be watching, what significance any of this will have on what is to come, if any at all, and that surely must be the point. Harry’s job is to record a conversation between two people. Beforehand, and even afterwards to a point, he doesn’t know what this conversation will be about, and what consequences may arise from passing it on to his employer. What details are significant? To whom? For what purpose? However – and for this reason I’d be terrible as a surveillance expert – this lack of focus and action left my attention wandering and me yearning for more. I found it somewhat difficult to concentrate and keep track of what was happening, and overall I was more than a little bored. Now I’ll be the first to stand up and say this is my fault for having the wrong set of expectations going in and, knowing what I do now about the nature of the story, I understand what frame of mind I should be in prior to watching, and what to look out for during the film, but after this first watch I’m not all that compelled to re-visit. I certainly will, because The Conversation has been heralded as a classic and I wish to find out why, it just won’t be for a little while yet. What I can say is that Hackman is terrific. I don’t think I’ve ever seen him give a sub-par performance, and here he’s perfect as Harry Caul, a man whose appearance and demeanour is so ordinary and bland that your eyes just kind of slide past him as he drifts from your memory seconds after he entered it. This film plays out almost like a character study of him, as his daily life and issues takes precedent over the plot on occasion, which again may be a reason I didn’t get on too well because I don’t often enjoy character studies in comparison to driven narratives. It was also quite interesting watching the tips and tricks of the surveillance trade. Not just watching them in action, but also seeing Harry attending a convention pedalling the latest gadgets for the professional eavesdropper. Watching Harry taking multiple recordings of the same conversation and splicing them together, altering the levels here and there to manipulate the crispest audio possible was strangely compelling, but whose to say if it would have had the same effect on me a couple of years ago before I’d edited any podcasts? 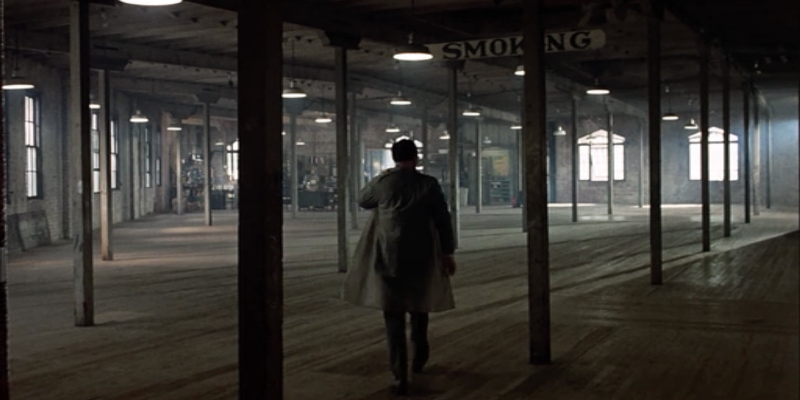 The cinematography is also unexpectedly beautiful for such a low-key film, particularly when showcasing the barren office within which Caul works. The only other recognisable actor from the main cast is a young Harrison Ford, who I assumed would be a kind of cameo, but actually turns out to be the antagonist, or at least a major henchman of such. Ford has just the right amount of smarm and self assuredness to alter his usual likeable rogue persona into someone you’d be more than happy to witness receiving his comeuppance. Consider this an incomplete review for now, as I greatly feel that The Conversation is worthy of a second viewing now I’ve a better understanding of what to expect. I spent most of this viewing waiting for the plot to kick in, when in fact it had reach its highest gear early on. I can definitely say I liked the ending, and the ambiguous nature with which we can take some of what has happened up to that point – who is to say how stable Harry’s mental state is given the paranoia-inducing nature of his work. This entry was posted in 07/10, 1001, 5-Star 500, Choose Film, Empire Top 500, Nominated List, Review, The List and tagged Allen Garfield, Cindy Williams, Francis Ford Coppola, Frederick Forrest, Gene Hackman, Harrison Ford, John Cazale, Robert Duvall, The Conversation by jaycluitt. Bookmark the permalink. Ah yes, you shouldn’t have gone into this expecting a prequel to Enemy of the State. They’re very, very different films. They just feature Hackman playing a similar character. I can understand why it didn’t grab you for this reason and because it’s rather slow and deliberately keeps the audience in the dark a lot of the time. I love it for that though. I find it’s the most effective film I’ve ever seen for creating a sense of paranoia. You’re never quite sure about what’s going on and who you should be worried about, so you’re constantly on edge. If this technique doesn’t affect you though, or if you don’t want to feel confused and paranoid, it wouldn’t be an enjoyable watch. It remains one of my favourites. I just bought the Blu-Ray in the sales actually, after only having seen it on VHS previously. Oh and I love that final shot. It’s incredibly bleak and powerful. Based on your passion for it I’ll definitely watch the film again, don’t you worry. I can imagine there’s certain shots here that will look fantastic on Blu.